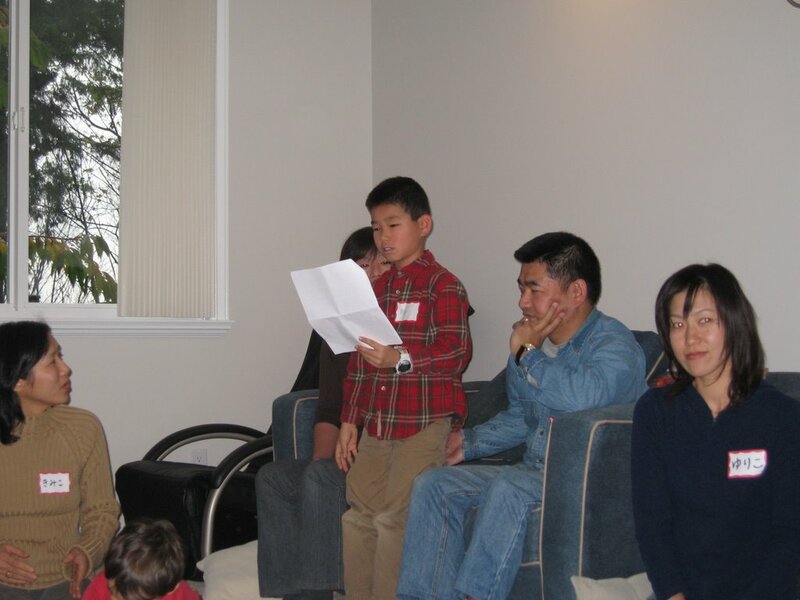 I attended the workshop "From Devils to Humans - Miracle in Fushun（撫順の奇跡）," given by historian Tatsuo Kage, held on November 23rd at Nikkei Heritage Centre in Burnaby, BC. Mr. Kage showed us a documentary video in which former soldiers and Kenpei (military police) officers gave testimony about the atrocious war crimes that they committed in China during the 15-year war (1931-1945) of invasion by Japan, and how one thousand of the Japanese prisoners wer e treated humanely and became repentant at the Fushun War Criminal Camp, and became peace activists upon repatriation. After the video Mr. Kage gave us a lecture on the "three miracles" that the Fushun experience brought about - "One, why Japanese prisoners were generously treated; two, how they became repentant; and three, how the heritage of their unusual experience is carried on by younger people in Japan" (from the lecture synopsis prepared by Mr. Kage) . 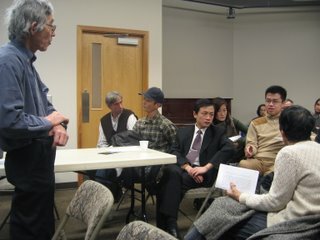 During the question and answer period, many of the over 30 participants who filled the meeting room at Nikkei Centre actively participated, including the several Chinese students and professionals whom we were very fortunate to have that evening (in the photo, Mr. Kage answers questions from Arc Z. Han and Vancent Zhu). 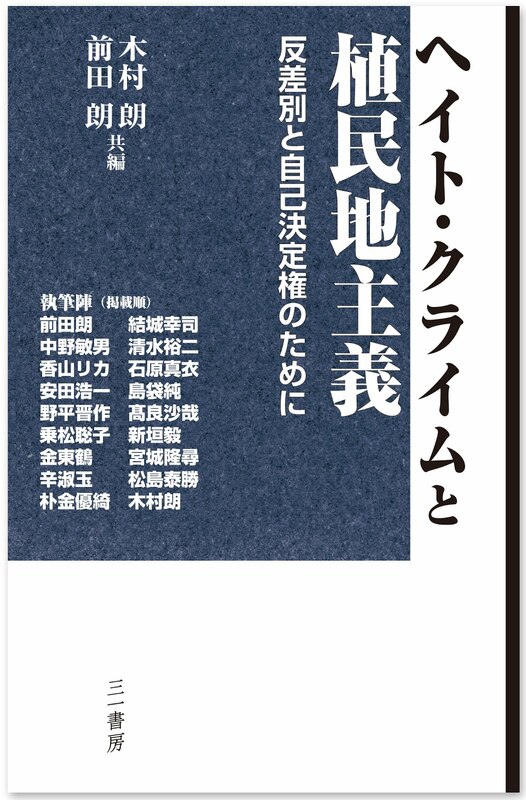 I had read about the Fushun war criminals before in the book (『なぜ加害を語るのか』), or "Why We Talk About Our Crimes"' by Shin-ichiro Kumagai (Iwanami Booklet No. 659), but I knew I had known nothing when I saw the scene in the video where a former Kenpei officer Mr. Tsuchiya visited the daughter of the Chinese man whom he tortured and killed in 1936. 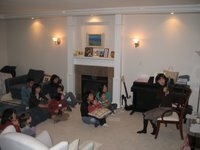 The visit took place in 1990 when the daughter, Ms. Zhang, was now a professor at a medical university. The former officer was bowing his head on the floor, crying and apologizing to Ms. Zhang. She was wiping tears off her eyes, and at the end she took Tsuchiya's hands. Crime, repentance, forgiveness, courage, and perhaps love and hope.... I cannot possibly begin to describe in words the emotions that filled the space that the former aggressor and its victim shared. I should not easily interpret the scene as one of forgiveness. The hand-shake with a man who killed her father must have been one of the most courageous and difficult things that she did in her life, and what drove that act of benevolence and what it really meant to her, to Tsuchiya, and people of China, Japan, and the world from the time of the war to now, is in God's realm. It is a miracle. It sends a message to the human kind that it should never forget - devils can become humans, and humans can become devils. The story of Miracle in Fushun has to be learned over and over again, for creating peace in today's and tomorrow's world. 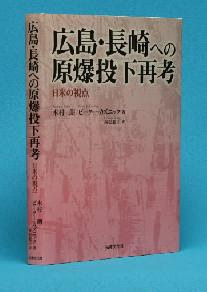 Shuichi Kato, a prominent public intellectual and an outspoken critic of the growing conservatism in Japan, said in a radio interview with NHK in August 2005, "Young generations of today's Japan are not responsible for the war crimes of their ancestors, but they have a responsibility for learning the history and examine whether the elements of the society that caused the past crimes are still found in today's society or not." 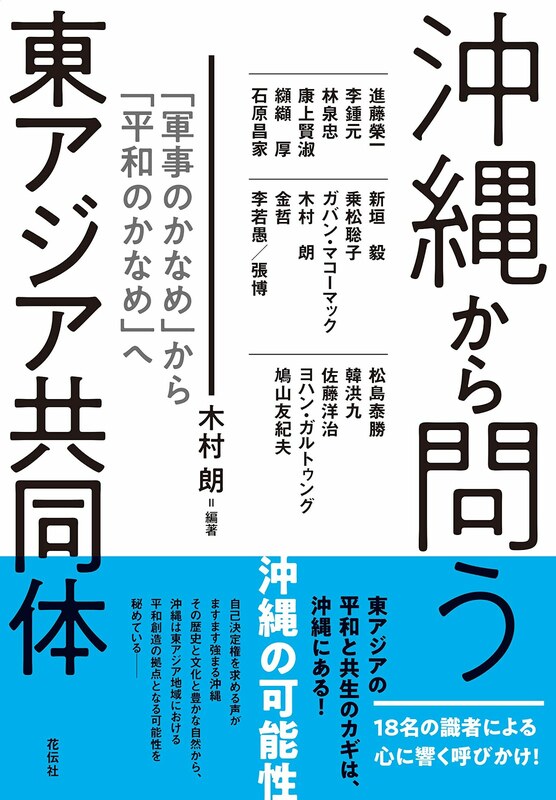 Kato points out four such elements that still exist in today's Japan in his book "War Responsibility of the Post-war Generations" (Iwanami Booklet No. 67) - manipulation by government through mass media, conformism, national isolationism (leading to ethnocentrism), and discrimination of all sorts. If these societal characteristics are still there, we may commit the same crimes again, so we must always maintain our critical thinking capabilities, and work to eliminate these elements of society. What Kato recommends is not easy, but it can be done. I will use the lesson from Fushun in my everyday life, from moment to moment, starting now. With my heartfelt thanks to Mr. Kage for this incredible learning opportunity. Congratulations! 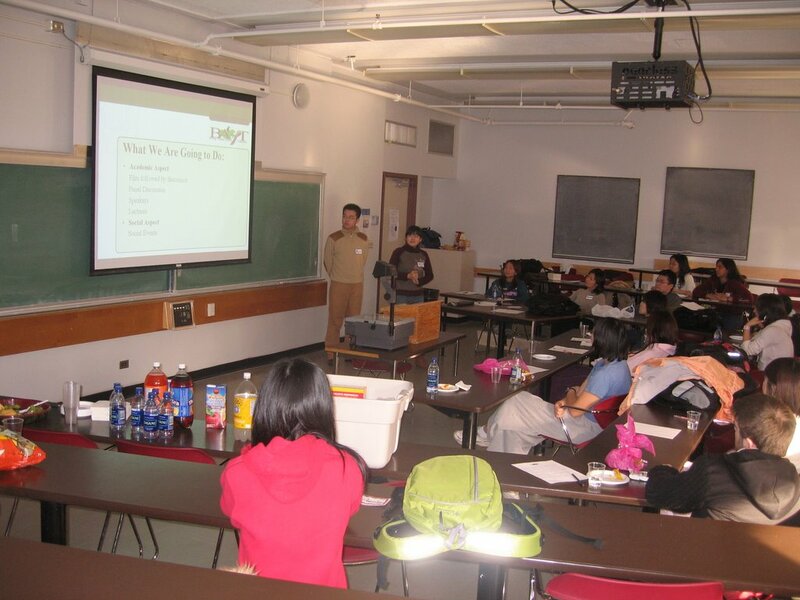 The first event of BAYT - Bringing Asian Youth Together was successfully held at UBC Point Grey Campus from 12:30 to 2:00 PM on November 24, 2006. The event started with the introduction of the original planning members (in the first photo - from right, Hyoshin, Zo, Vincent, Chinatsu, Wakiko, Arc, and Satoko). 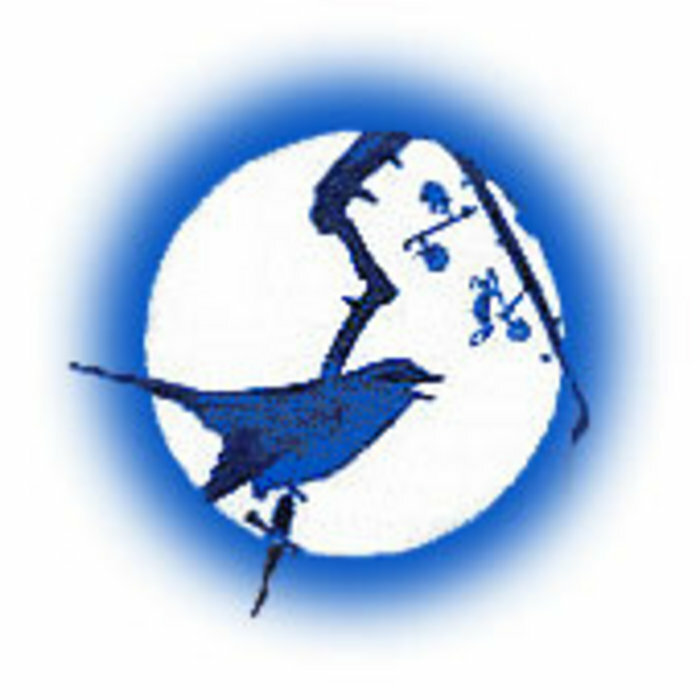 Absent that day was Ken, who created the BAYT logo. Then we did a PowerPoint presentation on BAYT, from how it started, what we are going to do, general rules to our mission statement. In summary, the idea of bringing Asian youths together for friendship and und erstanding started during a workshop on reconciliation in Northeast Asia at the Asia Regional Conference of the World Peace Forum, held on June 25th, 2006. Some participants of the workshop identified an opportunity for such a project in Vancouver where there are so many students from the region. 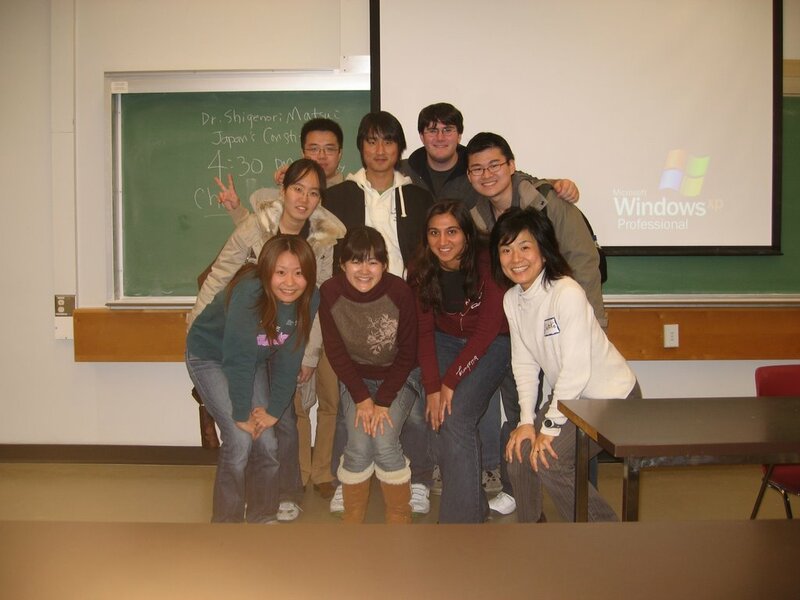 The original planning members are students and staff members of UBC and Langara College from China, Korea, and Japan, and eventually we want to expand to the larger communities. The purpose of this first event was really to introduce the idea of BAYT, involve more people and get more ideas than what we already have - film screening, guest speakers, social events, etc. At the end we divided the participants into three small groups to get more ideas about what we can do. Stay tuned for upcoming events! This project is going to grow and we will together bring harmonious future to Asia and to the world! For our event, Makie Blaine prepared all-natural hand-made healthy snacks - 'almond cookies' with ingredients like almond butter, maple syrup, spelt flour and coconut milk, and 'sweet potatoes and apples, 'chakin' way,' because it looks like chakin-sushi, or wrapped sushi, as you can see in this photo with Makie. Thank you Makie! 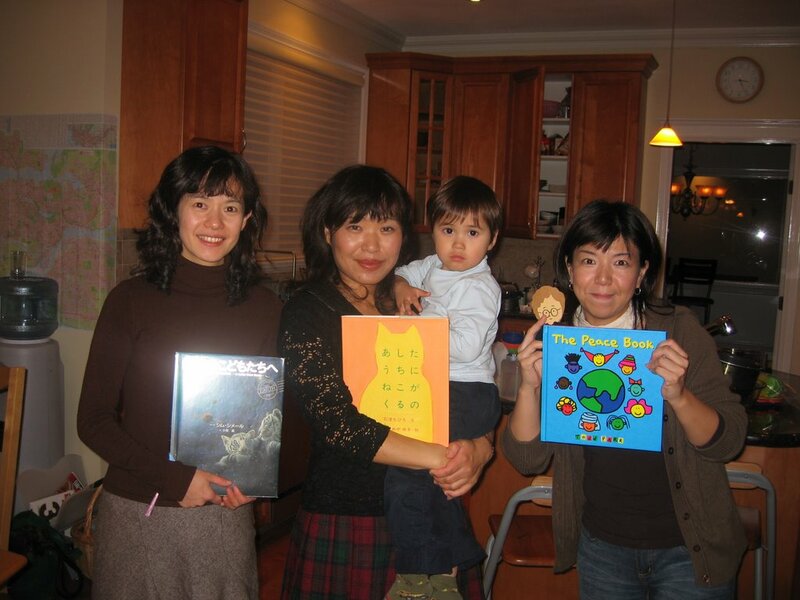 Here is the photo with the three Peace Philosophers of today - from left, Sayuri, Makie and her son, and Noriko. Thank you so much, this event happened because of your leadership and passion. My sincere thanks to the three students - Kayo, Shikiko, and Riho who helped out with the event, and Yumiko Kikuno, who took photos, stayed later to clean up and keep me company after the event. Above all, thanks to all for participating and helping. I hope and I am sure that you are all enjoying the difference that this event has made in your life and the difference that you are bringing to this world. The second session was facilitated by Sayuri, with focus on environment. 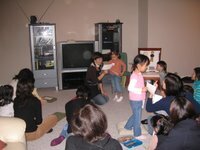 Adults and older children participated while little ones played at the basement. Sayuri played bea utiful meditational music and invited us to close our eyes and get connected with the Mother Earth. Sayuri's voice was mesmerizing and the sense of connection among all of us through meditation was just incredible. 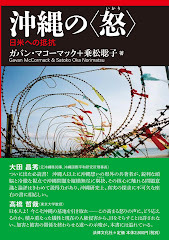 Sayuri read the Japanese translation of 'Children of the Earth - A Letter from Home' by Schim Schimmel. The book helped us realize how much the earth and its species loved us humans and needed our help, and that we are really one big family reliant on each other. 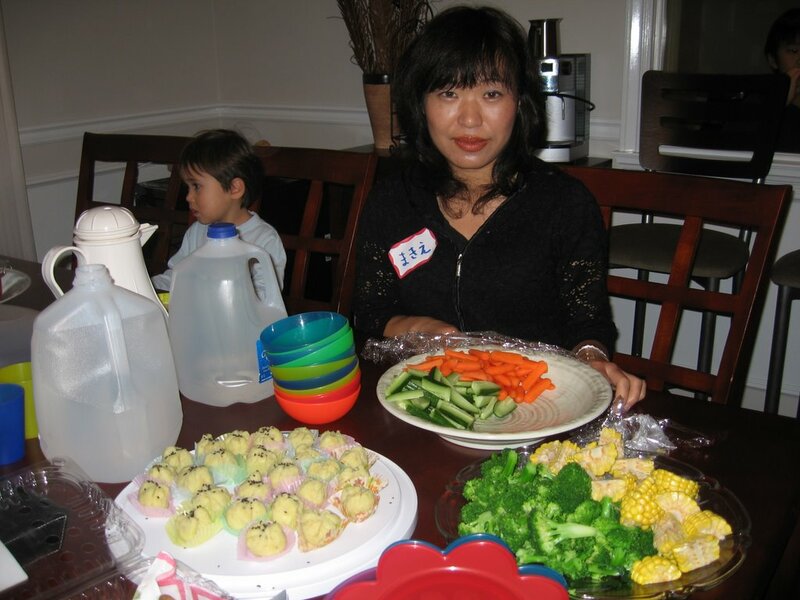 What many participants found particularly fun and effective was the way Sayuri brought soft toys of many endangered animals and became spokesperson for each of them - like Beluga whales in the Arctic Ocean, lions in the African deserts, and bears in the deteriorating forests. She brought photos of glaciers, one of 30 years ago and now to show us how much of it had melted, one of a disappearing island, and another of deserts that are quickly replacing forests. After seeing the realities of the world, Sayuri had us discuss what we could each do to stop the further damage to the earth and its species, after she shared a list of things that each household can do to reduce CO2 emission by a Japanese non-profit organization, and invited me to speak about the 10 things that I had recently started doing - like bringing my own towel, grocery bags, and co ffee mug when going out, and using recycled paper products if used at all and use a half of what I used before. Our group came up with many creative and doable ideas like showering less, walking to and from school, driving a hybrid car if we have to drive, composting, drying laundry indoors, using biodegradable products, turning off appliances like jars and computers. Sayuri said that environmentalist David Suzuki's family of four only produced one plastic-bag full of garbage per month, and that really shocked me. I have been doing what I can, and I can do a lot more! One challenge expressed by a mother was that it was hard for her to convince her Canadian husband to have a more earth-friendly lifestyle - its thriftiness to him seems like one that belonged to poor people. Some suggested ideas like having their children influence their fathers, and showing numbers like hydro bills being effective to encourage awareness in one's spouse. At the end each family group or individual presented a list of things they can and will do to reduce their impact on the environment. It was impressive how young children were so involved with this exercise, empowering their parents to think differently from what they were used to. Another wonderful material that Sayuri shared with us was the legendary speech by Severn Suzuki, David Suzuki's daughter at the 1992 Earth Summit in Brazil (for its text, go to http://gnome24.com/nature/severn/speech_01.html) How far have we come, 15 years later, now that CO2 emission is still increasing at an alarming rate? I am just made aware how oblivious I have been for all these years, being bogged down on micromanagement of family matters and my self-centred business and academic pursuits. I listen to Severn now. We cannot afford not to listen any more. 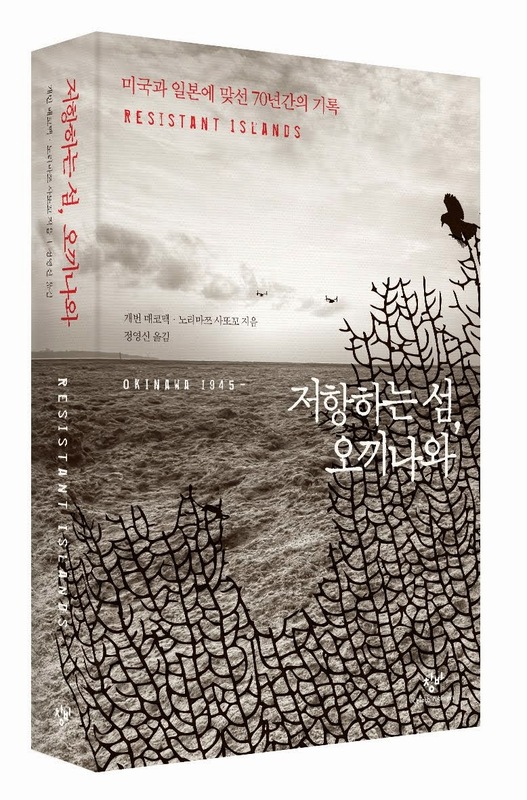 Thank you Sayuri for doing extensive research on the current situations of the earth and yet having us connect with the nature and the species with love and positive prospects for action. This is only the beginning. This event was held in Japanese, but I want to share the wonderful experience with the wider community, so I will write this report in English. 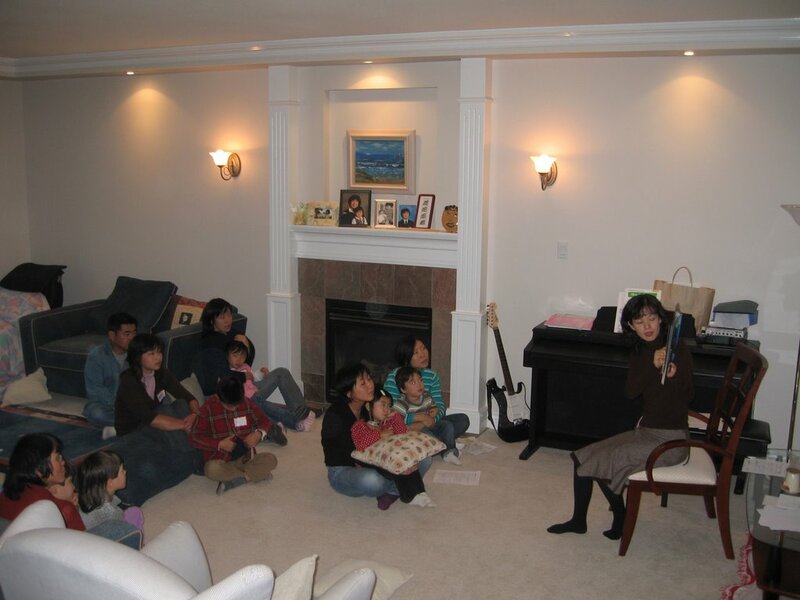 'Parents and Children Creating Tomorrow's World' was held on Sunday November 12th, 2006 at Satoko's house (the home of Peace Philosophy Centre for now) from 10 AM to 12:30 PM with 11 families (12 adults - 1 father and 11 mothers and 21 children age 0 to 9) and 5 adults. The event was held to raise awareness for peace and sustainability among families and for them to create actual plans to save this world. Peace Philosophers of today's event were: Noriko Ashizawa, an early childhood educator who grew up in Nagasaki and currently teaches at a Japanese language school in Vancouver, Sayuri Ishimoto, also an early childhood educator currently studying to be a licensed preschool teacher in the Capilano College ECE (Early Childhood Education) Program, and Makie Blaine, who shared her magical cooking skills by making healthy and delicious snacks for us. 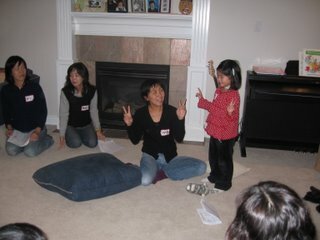 The first part of the morning was facilitated by Noriko and her session was focused on peace. 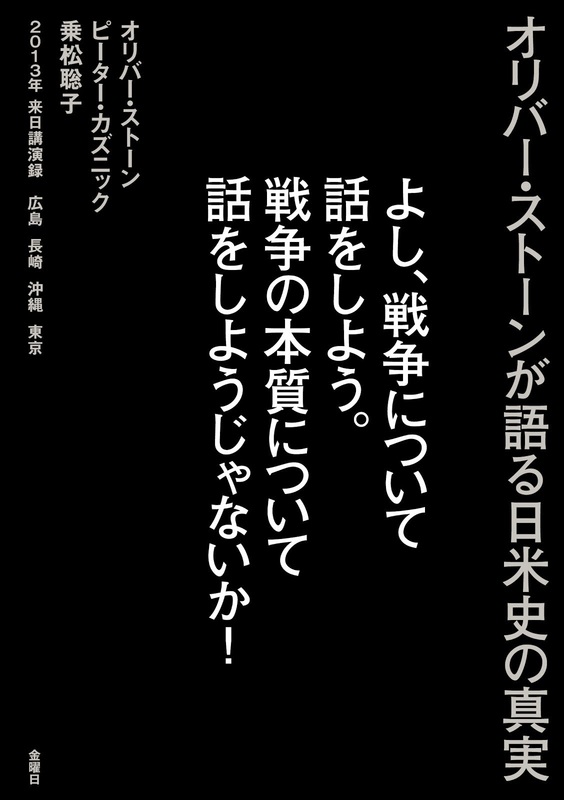 She used the DVD 'Peace Message' created by Ronnie Alexander that came with the general catalogue of Kyoto Museum for World Peace, Ritsumeikan University. 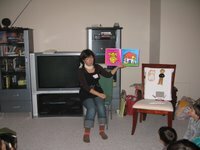 She brought hand-crafted felt dolls of the cat Popoki and Ronnie, two main characters in the DVD, and children were magically introduced into the colourful journey of exploring peace with Popoki and Ronnie. What is peace? What colour is it? What does it smell like? What does it sound like? Is peace being able to help each other? Is peace about loving each other? After showing the DVD, Noriko invited the children to draw on a piece of paper what peace was to each - also with a drawing of what their loved ones would look like when they are the happiest. Some children shared with us what they drew. Ms. E said peace was being able to play with her friends, being read to, and being able to write letters. Mr. K said peace was swimming. For Ms. M, the happiest she saw in her mom was whe n she cooked. 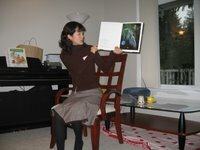 Noriko read to us 'the Peace Book' By Todd Park that talks about what peace could be about - e.g. sharing food, hugging friends, having a house to live in, being able to travel, being free, and being who you are. 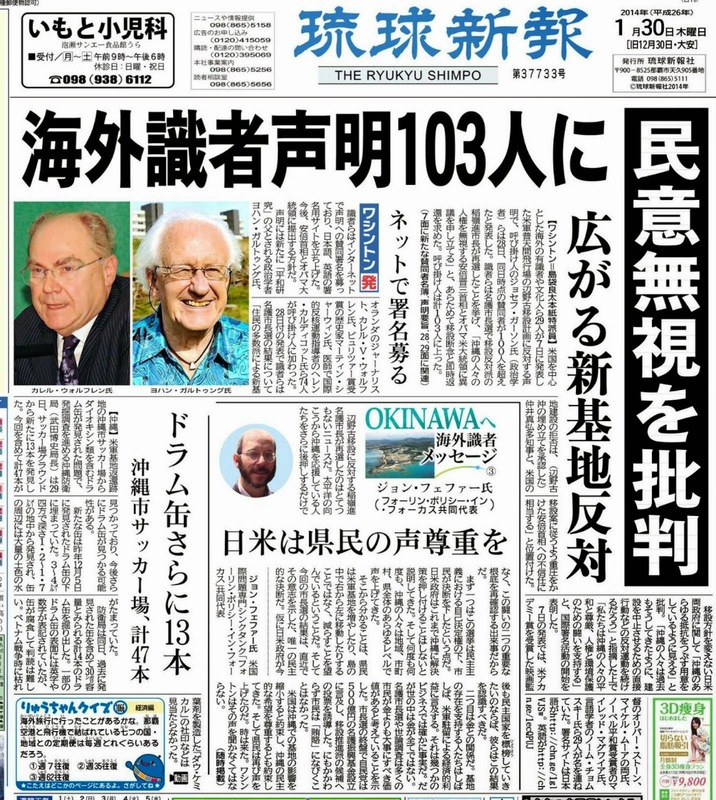 Then the room blacked out and now we were in the opposite world - we were in Nagasaki on August 9th, 1945 when the second atomic bomb on the human kind was dropped on the city and killed 70,000 people. It was the world where we were not free, we didn't have food, we were too hurt to hug each other, we didn't have a house to live in, we weren't able to travel, we weren't free, and we weren't who we were. With another blackout, we came back to the peaceful world. Peace has to be earned. It has to be earned every day, not just for oneself but for all others. Not just for the human kind but for all species. This is the message that I learnt from Noriko's session. Being from Nagasaki, she carries special energy for empowering people with hope for peace, the kind of hope that revived the city from the devastation in 1945. Thank you Noriko for sharing your passion for peace with us, and as always, your magical skills to draw children's attention and brings out the best of them. I will continue on to the next part. 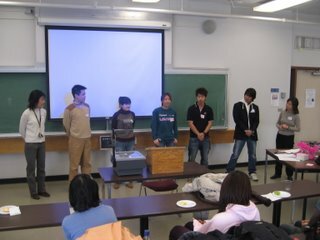 Since the World Peace Forum in Vancouver this June, several UBC and Langara College students and staff members including myself have been talking about starting a project that brings together youths who are from Asian countries or who are interested in Asian issues for open dialogue to build mutual understanding and trust. After 5 months of preparation, our first event is finally happening! I am so proud of the intelligent and passionate youths from UBC and Langara College who have taken initiatives in incubating and launching this project. Anybody of all ages from any community is welcome at this event. 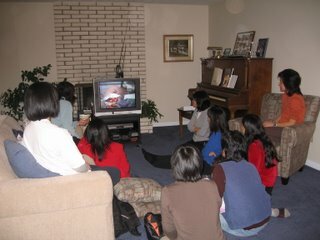 Bringing Asian Youth Together! 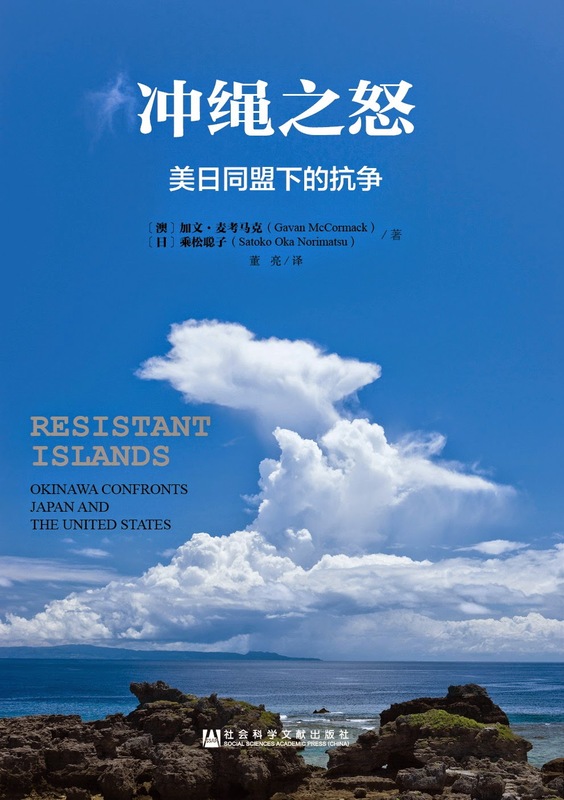 !Interested in Asian international affairs? Want to learn more about it? Want to share your thoughts with friends from other countries? 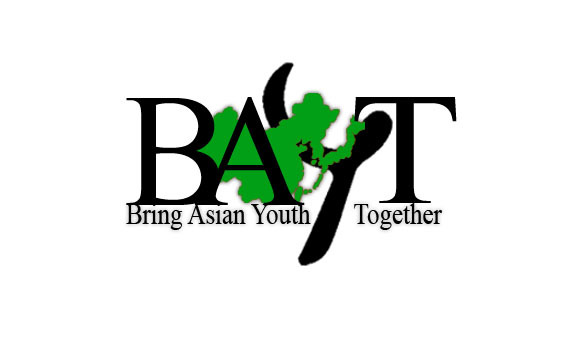 A new project, Bringing Asian Youths Together (BAYT) is initiated by UBC and Langara College students, in cooperation with the Asian Studies Students Association (ASIA, http://www.ams.ubc.ca/clubs/asia/). BAYT is pleased to invite you to our first event. 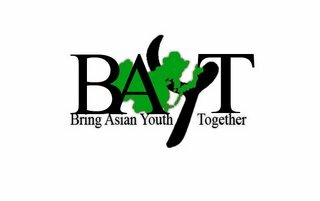 The goal of the project is to promote open and impartial dialogue among Asian youths, such as those from China, Korea and Japan. By exchanging opinions, leaning from each other and obtaining deeper knowledge, we will together broaden perspectives of the issues affecting East Asia and deepen understandings at grass-roots level. We believe this will bring harmony to the East Asia. 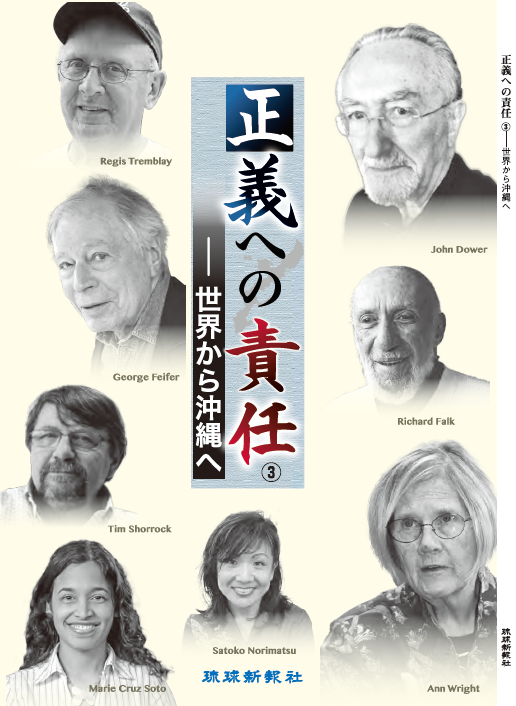 *This event is sponsored by Peace Philosophy Centre.
' Responsibility does not only lie with the leaders of our countries or with those who have been appointed or elected to do a particular job. It lies with each of us individually. Peace, for example, starts within each of us. When I read this, I thought about writing a family version of the Article 9. Aspiring sincerely to a family peace based on justice and order, Iforever renounce punishment as a right of a parent and the threat or useof force as means of settling family disputes. In order to accomplish the aim of the preceding paragraph, physical,verbal, and psychological violence such as neglect, confusion and double standards as well as other potential means of violence, will never be maintained. The right of belligerency of family members will not be recognized. I believe only when we exercise the Article 9 in our family, community, and workplace, we will be able to achieve the Article 9 in the world. It is hard work, and we can do it. The event organized by Vancouver Save Article 9 (http://www.vsa9.com/) was held fr om 7 to 9 PM at Langara College in Vancouver, with facilitators for four discussion groups, Tom Andrews (English), Tatsuo Kage, YumikoKikuno and myself (Japanese). Twenty-six people participated despite the heavy rain. 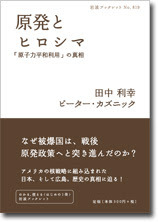 The prior reading was given to the Japanese groups (Chapter 5 of "The National Referendum on the Constitution Article 9" by Hajime Imai - a collectionof 39 diverse opinions on the Article 9), and the evening was divided into three sessions - Part I: discussion with emphasis on opinions one agrees with; Part II: discussion with emphasis on opinions one disagrees with; Part III: writing one's own Article 9. 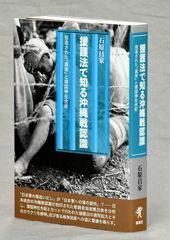 The Article 9 is the symbol of apology to the Japanese atrocities duringthe WWII. It is hard to interpret whether the right of collective self-defense isrecognized under the current Constitution. Japan should strive to make diplomatic efforts so it won't be a targetof attack, and if it were still attacked, I would rather die. The current Constitution has flaws. It is unacceptable for anindependent nation not to have armed forces. I believe in the power of words, instead of power of military means. 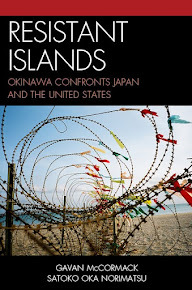 There are two ultimate choices when Japan is attacked - one is to fightback, and the other is not to fight back and call for the internationalcommunity to intervene. 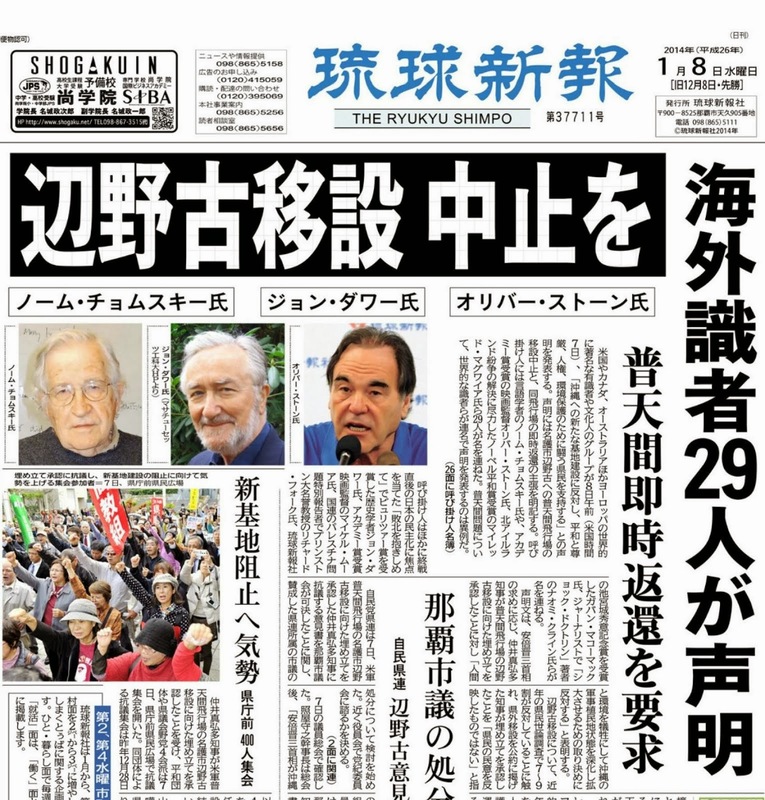 There were many people at the World Peace Forum conference on theArticle 9 that were impressed with the peace clause that was exceptionalin the world. We should keep the Article 9 for the sake of those people. 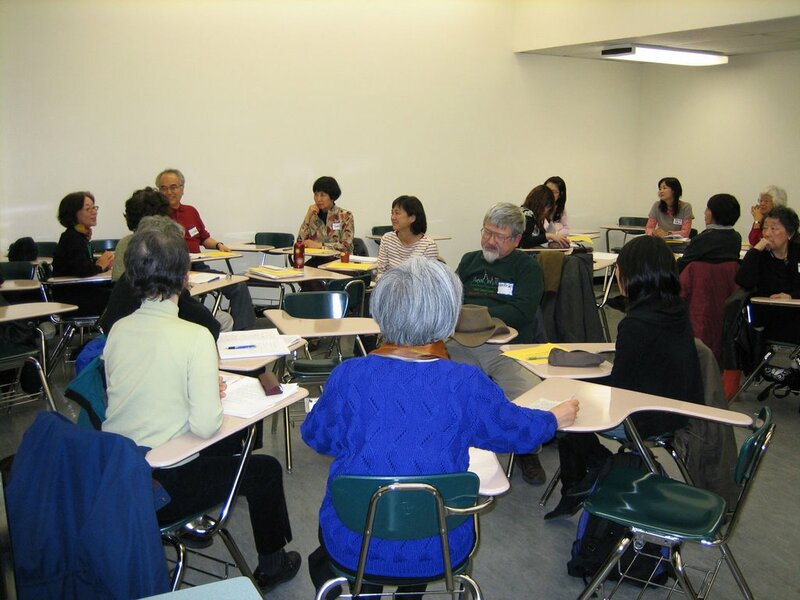 The significance of this event is that it has taken place outside ofJapan including an English-language discussion group, which presented different perspectives from those of the Japanese-language groups. To me they appeared more objective and analytical. Tom Andrews, the facilitator of the English group first presented the'points of departure' questions. I will quote some of them below. 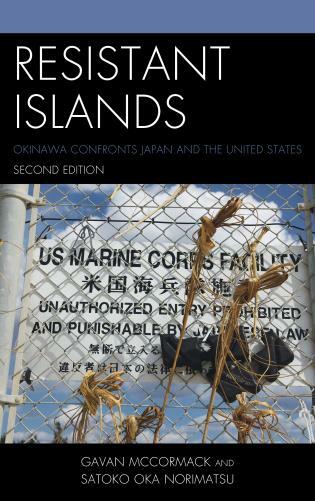 What are your views on the intent, meaning & consequences of Japanretaining or revising the Constitution, particularly Article 9? Is Article 9 practical in the context of today's world? What is thepossibility or consequences of Article 9 being extrapolated to andimplemented in other countries? If you were given the opportunity and power to write an Article 9-likeclause for Canada's constitution, how would you phrase it? WHat wouldthe words and inclusion mean for Canada, for you personally? Following is Tom's report of the discussion in the English group. Following are some of the comments that participants shared with us. Being in the English group, it helped me to gain some knowledge aboutCanadian's understanding. 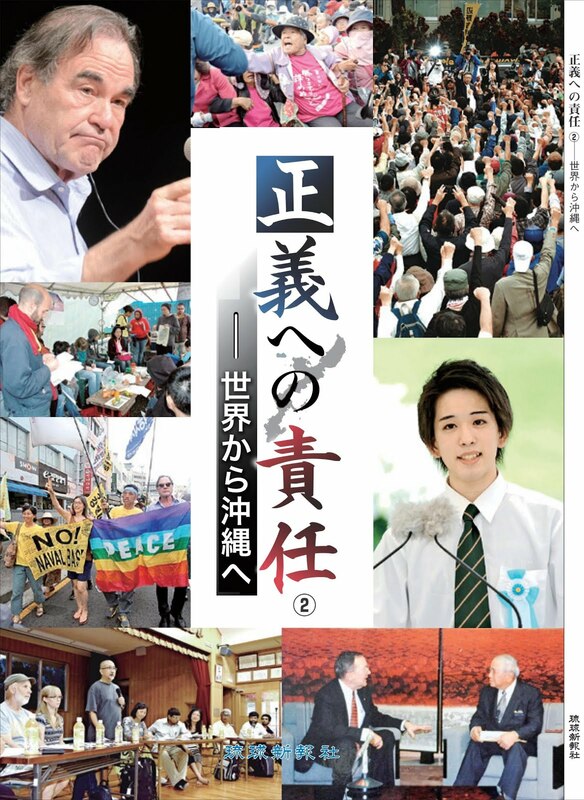 I hope I can bring some Chinese people,especially young people to our discussion next time. It was meaningful to exchange ideas with people from differentgenerations. The reading was long and there was gap between those whohad read and who had not. A brief summary of points for discussionwould have been helpful. The 'discussion guidelines' and the availability of structured programnotes were helpful. I wanted to hear more from the people in the other groups. I found it a little bit noisy during open discussion. I thought the "Questions for a point of Departure..." were very usefulin focussing our discussion. David and Tom's insights were most helpful. This format seems well-suited for an exchange of ideas amongwell-informed people, and this is a good thing. Not being personallywell-informed on this issue, I will be watching to see if there is alecture that will provide an opportunity to learn more. Thank you forproviding this opportunity to an outsider like myself. I thought it would be a challenge to write my own Article 9, but somepeople participated and I thought it was good. The main objective of this event was for people with different opinions to get together to learn from each other, clarify one's opinion and gain new perspectives, and I believe this objective was generally well-achieved. I thank the participants for this precious opportunityof learning and sharing, and for the constructive suggestions for future events. 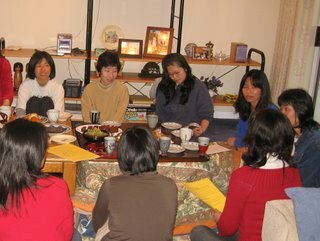 On Saturday November 4th, 13 women gathered at Ms. Mariko Yamamoto's home to talk about current issues in Japan and beyond. This is the fourth of such an event in Surrey. As soon as I entered Mariko-san's home, I felt this incredible energy and warmth from this group of 13 women. Some of them had attended the previous events and others were the first-timers, so at the beginning I was not too surewhat the participants would expect of this gathering. As I invited everyone to introdu ce themselves and share their expectations and questions, we naturally flowed into a stimulating discussion on topics from the revision of the Fundamental Law ofEducation, the issue of Hinomaru (the national flag of Japan) andKimigayo (the national anthem of Japan) issue at Japanese schools, PrimeMinister's visit to Yasukuni Shrine, to the dangers of DU (DepletedUranium) weapons and global warming. I want to explore what I can do as a mother. I want to start by knowing things I don't know yet. I would like to explore what I can pass on to the next generation. I am interested in food safety and natural healing. I showed the pictures and videos that I took when I visited Yasukuni Shrine on the morning of August 15th when then-PM Mr. Koizumi was there, to show how the right-wingers were freely expressing their opinions with large flags and banners right inthe middle of Yasukuni Shrine whereas those who oppose Koizumi's visitwere banned from the premises. 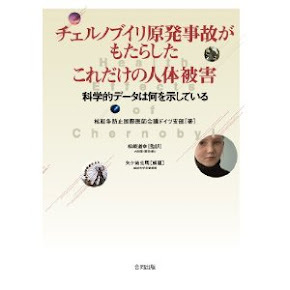 At the end I showed the DVD that I obtained at the 3rd ICBUW(International Coalition To Ban Uranium Weapons) Conference held inHiroshima from August 3rd to 6th, 'Unknown Terror of DU - Iraqi ChildrenNow-'. Many participants commented that they had been informed of therisks of DU weapons but they only knew the scale and seriousness of the damage when they saw this video. 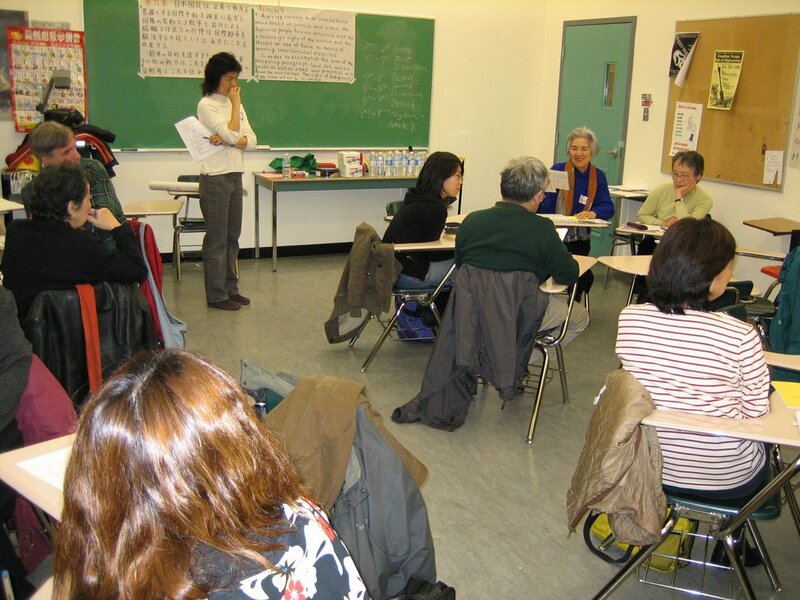 I would like thank Mariko Yamamoto for hosting such an engaging eventfull of learning and meaningful conversation, Kyoko Hara and Seiko Roberts for co-organizing this event, and Yumiko Kikuno for coming with me to help with the event. Thank you to all who participated in this event on the very rainy Saturday afternoon. We should definitely get together on a regular basis and maybe at the next meeting develop some concrete action plan to help the world.